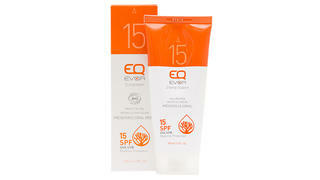 Tested and approved by surfers the world over, EQ's organic sunscreen uses only natural ingredients to create quality sun protection that won't harm the environment. The sun cream replaces corrosive chemicals with apricot seed oil, safflower oil, olive oil and beeswax and is available in SPF 15, 30 and 50 as a cream, stick or lipstick. A body care range comprising after sun, self-tanning lotion and dry oils made using ocean-friendly ingredients is also available. 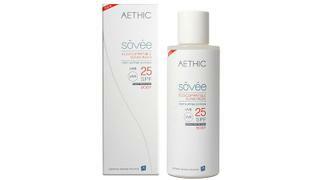 Created by scientist Allard Max and sustainability expert Susannah Stewart, founders of marine conservation charity Going Blue, Aethic Sôvée is the world’s first Marine Positive certified sun cream. Containing three photo-stable sun filters, three organic moisturisers and antioxidant vitamin E, the sun cream is packaged in a biodegradable bottle to make it 100 per cent coral safe. Whether your surfing or scuba diving, this is the perfect answer to guilt free, skin-safe sunbathing wherever you take your superyacht. 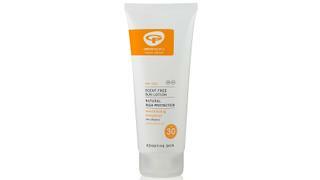 Priding itself on providing “the purest sunscreen nature can offer”, Green People’s sun lotion is free from parabens, alcohol, phthalates, petrochemicals and a host of other artificial ingredients that create water pollution. Instead it contains organic olive, avocado, green tea, rosemary extract and is free from essential oils resulting in water resistant sun lotion perfect for sensitive skin that promises broad-spectrum UVA and UVB protection. Plus 30p from the sale of every bottle is donated to the Marine Conservation Society. 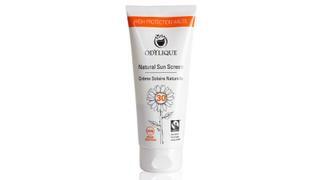 Both Fairtrade and organic certified, Odylique's natural sunscreen has been formulated for highly sensitive skin making it ideal for babies and children as well as adults. Containing zinc oxide, karanja seed and raw shea butter plus chamomile, rosemary and sea buckthorn extract, Odylique's sun cream provides UVA and UVB protection to SPF30 and is also suitable for vegans. Founded by Margo Marrone in 2002 to do exactly what it says on the tin – provide organic, natural products for a range of health and beauty needs – The Organic Pharmacy is one of the industry’s most trusted names when it comes to environmentally friendly lotions. Its Cellular Protection suncream replaces synthetic chemicals with zinc clear, pearl extract, pongamia and shea butter to create a cream that is reliable, nourishing, luxurious and completely marine-safe.